From a security perspective, Unicode domains can be problematic because many Unicode characters are difficult to distinguish from common ASCII characters. It is possible to register domains such as "xn--pple-43d.com", which is equivalent to "аpple.com". It may not be obvious at first glance, but "аpple.com" uses the Cyrillic "а" (U+0430) rather than the ASCII "a" (U+0041). This is known as a homograph attack. Visually, the two domains are indistinguishable due to the font used by Chrome and Firefox. As a result, it becomes impossible to identify the site as fraudulent without carefully inspecting the site's URL or SSL certificate. This Go program nicely demonstrates the difference between the two sets of characters. Internet Explorer, Safari, along with several less mainstream browsers are fortunately not vulnerable. Screenshots: Google Chrome, Firefox, Firefox SSL, Internet Explorer, Internet Explorer SSL. This bug was reported to Chrome and Firefox on January 20, 2017 and was fixed in the trunk of Chrome 59 (currently in Canary) on March 24. The Chrome team has since decided to include the fix in Chrome 58, which should be available around April 25. The existence of the bug in Opera was brought to my attention only after the initial publication of this post. The problem remains unaddressed in Firefox as they remain undecided whether it is within their scope. The Bugzilla issue was initially marked "RESOLVED" and "WONTFIX", though it has since been reopened, made public, and given the "sec-low" keyword. Firefox users can limit their exposure to this bug by going to about:config and settingnetwork.IDN_show_punycode to true. This will force Firefox to always display IDN domains in its Punycode form, making it possible to identify malicious domains. Thanks to user MARKZILLA from reddit for this temporary solution. A simple way to limit the damage from bugs such as this is to always use a password manager. In general, users must be very careful and pay attention to the URL when entering personal information. Until this is fixed, users should manually type the URL or navigate to the site via a search engine when in doubt. I hope Firefox will consider implementing a fix to this problem since this can cause serious confusion even for those who are extremely mindful of phishing. To put it in simple terms, it has been easier to perform phishing attacks; the attempt to obtain sensitive information such as usernames, passwords, bank- and credit card details, often for malicious reasons. The most widely used method is cloning real websites and sending the fake websites to the victim(s) by E-mail. When a victim enters their sensitive information on a fake website, this information is uploaded to the phisherman's database and the victim is redirected to the real website, often to the "incorrect log-in details" screen. When the victim enters their correct sensitive information again, it will work and they may think that they entered something wrong the first time, but they will not know what really happened. As you can see, the difference is quite obvious. However, with the technology being improved for each day that passes, new methods are being used. One of them is the use of Unicode domains (basically domains with foreign characters). It is almost impossible to detect anything strange with these domains, as you can see in the screenshot below. This vulnerability in Google Chrome and some other webbrowsers has finally been patched. 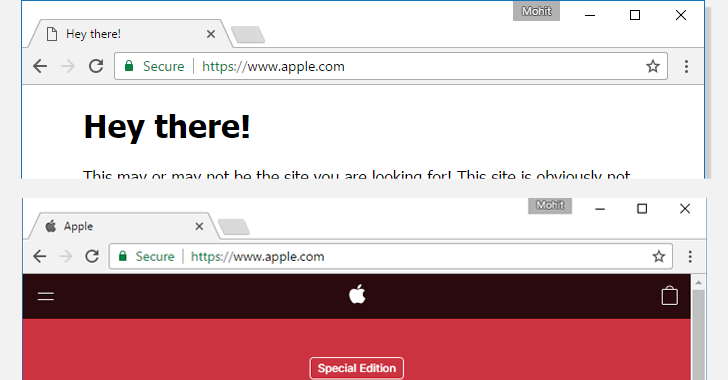 The URL of the fake website above will now show "https://www.xn--80ak6aa92e.com" rather than "https://www.apple.com/" and it is thus obvious to anyone that this is not the real website. A good rule of thumb is to never open any suspicious links you receive by anyone, no matter how convincing it may be. Dam! Honestly until now I did not pay a lot of attention to the URL know I would never click on that "Hey".So where would we run into this? And thank you for making me more aware this stuff.Boy would I love get me hands on one of these knuckle heads they can ruin you.Good stuff. Edited by In98, 21 April 2017 - 03:20 PM.